The Roc is simply the best, most versatile mid-range disc ever made. It provides accuracy at any range. This disc can take and hold the angle of release, even into a headwind. It can be used for driving, upshots, straight shots, hyzer shots or anhyzers. The Roc ages gradually and predictably. If you&apos;re not sure what disc to throw, choose the Roc; just like most pros. Mid-Range Discs are designed to provide accuracy and control for a wide array of shots. Bridging the gap from putter to driver, Mid-Range discs are versatile and effective in many situations. Mid-Range discs have a variety of uses from tunnel shots to flex shots, from short drives to approaches. When tight windows need to be hit and shot placement is crucial, Mids are the disc of choice for most players. Whether you&apos;re a Pro or just starting out, we offer a wide range of Mids to match the needs of players using diverse throwing techniques. 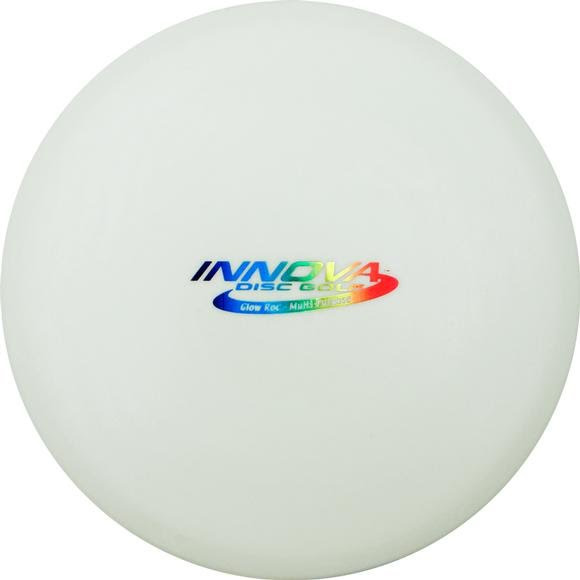 INNOVA&apos;s Glow Plastic is produced with a unique plastic that illuminates when exposed to light. It will hold a charge for a while, and can be easily recharged with a flashlight, UV light (blacklight) or camera flash. Glow plastic was one of our first premium plastics and it has a unique gritty feel that many players like, especially in Aviars and Rocs.